Openfire is a cross-platform instant messaging server written in java. It is easy to install and setup. It is available as a free download by Ignite Realtime website. You can also use their client software Spark to connect with your Openfire server. Another client that you can use to connect to your Openfire server is Pidgin. Openfire requires Java Runtime environment to run. If you want to install Openfire on RPM-based systems then you don’t need to install Java as the Openfire installer for their distribution already includes a JRE. You will need to install Java on your Debian-based system before running Openfire server. Download and Install Openfire on CentOS 7. 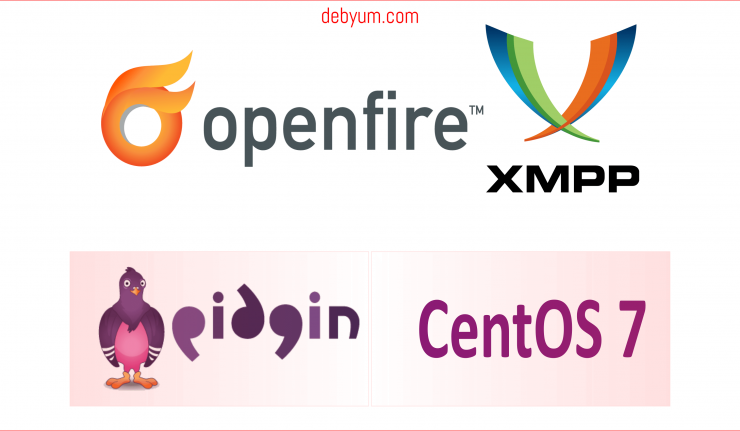 Download and install Openfire XMPP server. Setup database and user for Openfire server. Install Zapcat Plugin in Openfire. Increase Java memory limit for Openfire server. Install Openfire on CentOS 7. Edit /etc/hosts file and add the following line in the file. Download and Install Openfire 4.2.3 server. Download the latest version of Openfire 4.2.3 on CentOS 7. Install Important libraries required by Openfire. Configure PAM Authentication policy for OpenFire. we will replicate “system-auth” policy for Openfire service. Set Root as Process User for OpenFire. Also, configure logging for OpenFire. By default OpenFire logs everything in /opt/openfire/logs directory. Make log directory if not already present on server. To view Real time logging of OpenFire service, use the following command. Enable Openfire Service at Reboot. Check the status of OpenFire service. Check the Ports used by OpenFire. Setup database and user for Openfire. We will install Latest MariaDB server by creating a repo file in /etc/yum.repos.d directory. Then enable that repo. for MariaDB. Check the MariaDB server version. Enable the MariaDB server at Reboot. Create a User and Database for OpenFire server. Now we have created a database and user for our Openfire server. We can now start configuring Openfire server by visiting the Installation page of Openfire. Login to your Openfire XMPP server. Select a Language to use with your OpenFire XMPP server. Openfire server will detect your system hostname. Enter the Domain name you want to use with your Openfire server. Select Property Encryption via AES. Select the database Type. Select Standard Database connection if you want to use an external database for openfire. If you want to use inbuilt/Embedded database of Openfire server then select the Embedded Database option. If you want to use an external database, which we are in this tutorial, then select MySQL option in Database Driver Presets. Now Edit Database URL field. Our database-name is fired and host-name will be 127.0.0.1. The end result will be something like this. Next, The Username will be the user/owner of the database, which is cool in our example :). Next, Enter the Password of user cool. In this example it is cool_fired. Also you can select the Minimum Connections, Maximum Connections, Connection Timeout according to the server resources and capacity. Choose Default in your Profile settings. Finally, enter your Admin email address and a new strong Openfire admin Password to finish the setup. 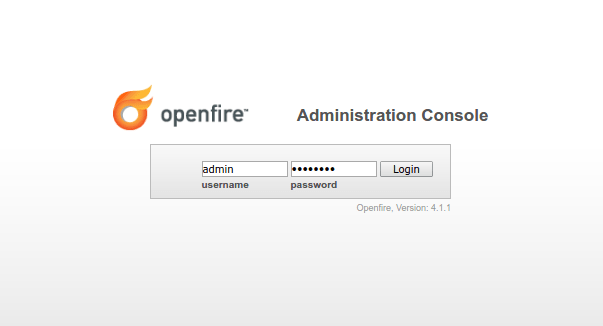 Click on Login to the Openfire admin console to Access your Login console. Finally, Enter your Username which is admin by default and the Openfire admin password to login to your Openfire XMPP server. Also You can install plugins like Zapcat in Openfire XMPP server. First Download Zapcat plugin for Openfire from Sourceforge. Extract the Zapcat plugin from the zip file. File with name zapcat-openfire-x.x.jar is the important one. Go to the Administration console of you Openfire server. Also Click on the “Plugins” tab > Choose File > Select the file and then click Upload Plugin. Once installed you can see the new plugin in the Plugins list. Increase Java memory in Openfire. Edit /etc/sysconfig/openfire file and add these lines at the end of the file. # Increase Java memory in Openfire server. Please give me a solution. that Backup of Openfire 4.1.1 and Upgrade with 4.2.3…. Hello there. please check the article on upgrading openfire to latest version. here is the link.